It's Not War. It's Survival. A Marine platoon fights to prevent the city of Los Angeles from being overtaken by a race of highly advanced alien invaders in this epic sci-fi action thriller from director Jonathan Liebesman and producer Neal H. Moritz. After decades of speculation about life on other planets, the people of Earth discover that extraterrestrials really do exist when destruction rains down from the stars on cities all across the globe. 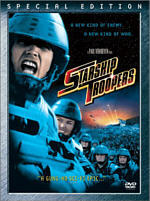 When the alien warships descend upon Los Angeles, however, the ferocious invaders discover that humankind won't go down without a fight as a gruff Marine staff sergeant (Aaron Eckhart) and his fearless troop of jarheads point their weapons skyward and make one last stand for the entire human race. $35.573 million on 3417 screens. 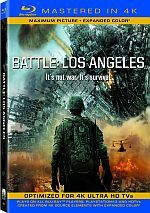 For a new take on the alien invasion genre, we go to 2011�s Battle: Los Angeles. A meteor shower hits the Earth, but it quickly becomes clear that these aren�t ordinary space rocks. Instead, they�re vehicles used to transport aliens, and they contain armies here to take over the planet. They land outside of major population centers, all of which contain ample supplies of water. While the entire world deals with this threat, we focus on attempts to rid Los Angeles of the aliens. Battle shows us the efforts of a Marine platoon led by 2nd Lt. William Martinez (Ramon Rodriguez) and Staff Sgt. Michael Nantz (Aaron Eckhart) as they take their soldiers to rescue stranded civilians in Santa Monica. Along the way, they fight the aliens and hit upon many snags. I hate to follow the broken record path, but until I stop reviewing movies with excessive hand-held camerawork, I�ll continue to beat the drum. The MPAA needs a new rating to let viewers know that they�re entering a Shakycam Zone. Who shoots these films, bobblehead dolls? Unfortunately, shakycam shows no signs of abating, and Battle gives us a new example of the style�s problems. Here�s the thing: filmmakers seem to believe that the documentary format lends a sense of urgency and vitality to their films, but the opposite is true. Some exceptions exist, but shakycam usually robs movies of their drama and thrills. Battle re-establishes this. At its core, this should�ve been an exciting action flick. After all, it barely bothers with plot or character development. Sure, we get some hints of Nantz�s troubled past, and a quick prologue throws out some basics for a few of the other Marines, but these do little to allow us to invest in the characters. The Nantz thread is the only one that remotely goes anywhere, as the others just fill a little time; most go forgotten pretty quickly. With little in the way of character information and a plot that never rises above the level of �shoot the aliens�, Battle requires vibrant action to succeed. I think it might�ve been able to deliver the goods if only it abandoned the shakycam. The cinematography makes it damned near impossible to tell what�s happening most of the time, and the style adds no realism or urgency. Instead, it just becomes a distraction. I don�t feel like I�m part of the action when I see all that bobbing and flailing photography; I just feel annoyed, as I can't figure out who�s doing what to whom. Since Battle attempts to deliver almost two hours of nearly non-stop action, the lack of visceral thrills lands into the �fatal flaw� category. �Dull� isn�t a good word to attach to an action flick, but it fits here; a few sequences provide a bit of drama, but most just feel so confused that they fall flat. Indeed, too much of Battle comes across like the filmmakers� desperate attempts to make this a big old earth-shaking action movie. In addition to the pointlessly busy camerawork, it comes with virtually nonstop score. Does one second of this movie pass without music? Probably, but I left it with the impression that it delivered wall-to-wall score, and that became a distraction, partly because Brian Tyler opts for a �drama pushed to 11� sensibility. There�s no range to the music; it�s all climax all the time. The same can be said for the movie itself. It allows for so little downtime that it feels like the entire film wants to be one long finale. This doesn�t work, as it throws off the pacing and threatens to harm the actual finish. I will admit the real conclusion does deliver the movie�s best punch, but that�s due more to the stakes involved than the staging; in terms of the manner in which the scene progresses, it feels a lot like everything we saw before it. It doesn�t help that Battle never establishes its own identity. The plot clearly borrows heavily from War of the Worlds, and the movie includes so many obvious �homages� to other flicks that you�ll want to bring a scorecard. You can check boxes when you note the clear influence � that might be more fun than the movie itself. Derivative flicks can still be fun � I remain an unabashed fan of Independence Day - but they need to do more than act as an amalgam of other movies. Battle: Los Angeles has all the prerequisites necessary to be an exciting, dynamic sci-fi action movie, but it fails on almost all accounts. It�s simply too much of a mess to deliver the goods. Old DVD fans will remember Sony�s �Superbit� program, as it came with similar promises. Superbit DVDs and �Mastered in 4K� BDs jettison all supplements to theoretically optimize picture/audio quality. In this case, the image consistently excelled. The film�s documentary-style cinematography meant that the occasional soft shot occurred, but that was due to �on the fly� focus. The appropriately composed elements � which comprised the vast majority of the flick � provided concise, distinctive images. I noticed no shimmering or jaggies, and edge haloes failed to appear. Print flaws also weren�t a factor in this clean presentation. Much of the film opted for a khaki palette that matched the Marine uniforms. Interiors tended toward a blue tint, while the night scenes that dominated the last act veered toward blue-green. These stylistic choices limited the color range, but I thought the hues looked solid given those choices. Blacks were deep and dense, and shadows showed clear definition; low-light and nighttime shots offered excellent visuals. I felt impressed with this terrific transfer. Similar praise greeted the intense DTS-HD MA 5.1 soundtrack of Battle. I�d expect non-stop action from a war movie about an alien invasion, and that was what I got here. From start to finish, the movie used all five channels as nearly constant partners. Music filled the whole spectrum in a satisfying way, and effects demonstrated tremendous breadth. Battle certainly gave the audio plenty of opportunities to excel, and it delivered. We got plenty of gunfire, flying vehicles, explosions and similar elements, and all added pep to the film. The components showed fine localization and blending; everything came from the right spot and the pieces fit together in a smooth way. Audio quality lived up to the standards of the soundfield. Music was bold and dynamic, and speech seemed concise and crisp. Effects demonstrated terrific range; highs were tight, and lows became deep and full. Bass response added a real kick and gave the movie great power. This is the kind of soundtrack you thought of when you dropped big bucks for your home theater; it�s true demo material. How did this 4K Blu-ray compare to the 2011 Blu-ray? Both seemed virtually identical to me. If the 4K presentation managed any improvements, they were minimal, as the original disc already looked/sounded great. As stated earlier, the 4K line leaves out any extras. That means the featurettes and other elements get the boot here. Since I love action movies and sci-fi flicks, I had high hopes for Battle: Los Angeles. Unfortunately, the movie turns into a major disappointment, as its shaky photography and poor pacing make it a bit of a chore to watch. The Blu-ray delivers excellent picture and audio but drops all supplements. This was a terrific presentation of the film, but so was the original Blu-ray; since the latter comes with some decent extras, it�s the one to own.